i walked into madewell the other day & decided that i needed to get one of everything so i could look as cute as one of my favorite bloggers, annie of the other side of gray. thankfully for my wallet, my common sense won out & all i walked away with was this station workshirt that i'd been eyeing up since it showed up in madewell's stock. but now that i had at least one madewell piece, nothing was going to stop me from trying to copy-cat one of annie's signature looks with my own little monochrome twist [in green for st. patty's day, natch]. also, can we just talk about these jeans for a second? they're from diesel's new jogg jean line and are literally part sweatpants. that's right, you read that right, jeans that are as comfy as sweatpants. [it's as if my college prayers have been heard by the jean deities and answered years later]. i opted for this fun worn-in look and have been wearing them every chance i get. [ah-mazing]. thanks girl! so comfy too! Ooo, jeans as comfy as sweat pants? Hmm, must go check these out. love when another blogger inspires you!!!! and plus you are rocking this look! This is so cute! I keep checking the Madewell stuffs too but argh you know how it is so confusing when we shop right! You look good! The color suits your complexion perfectly!!!! 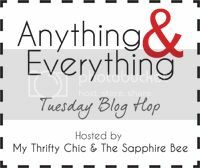 Thank you for linking up with the Anything & Everything Blog Hop!